Microsurgery in Endodontics provides the definitive reference to endodontic microsurgery, with instructive photographs and illustrations. 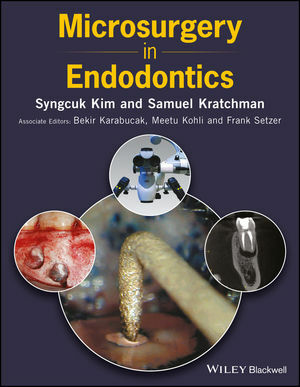 Syngcuk Kim, DDS, PhD, MD (Hon), is Louis I. Grossman Professor and Chairman Emeritus in the Department of Endodontics and Associate Dean for Global Affairs at the University of Pennsylvania School of Dental Medicine in Philadelphia, Pennsylvania, USA, and maintains a private practice in New York, New York, USA. Samuel Kratchman, DMD, is Clinical Associate Professor and Assistant Director of Graduate Endodontics and Director of Microsurgery in the Department of Endodontics at the University of Pennsylvania School of Dental Medicine in Philadelphia, Pennsylvania, USA, and maintains three private practices limited to endodontics in Exton, West Chester, and Paoli, Pennsylvania, USA. Bekir Karabucak, DMD, MS, is Chair and Associate Professor of Endodontics, Director of the Postdoctoral Endodontics Program, and Director of the Division of Advanced Dental Education at the University of Pennsylvania School of Dental Medicine in Philadelphia, Pennsylvania, USA, and maintains a private practice in Philadelphia, Pennsylvania, USA. Meetu Kohli, DMD, is Clinical Associate Professor of Endodontics and Director of the Continuing Education and International Program in the Department of Endodontics at the University of Pennsylvania School of Dental Medicine in Philadelphia, Pennsylvania, USA, and maintains two private practices limited to endodontics in Oaks and Gilbertsville, Pennsylvania, USA. Frank Setzer, DMD, PhD, MS, is an Assistant Professor, Clinical Director, and Pre-Doctoral Program Director in the Department of Endodontics at the University of Pennsylvania School of Dental Medicine in Philadelphia, Pennsylvania, USA, and maintains a private practice in Philadelphia, Pennsylvania, USA.